Our Stroke Improvement program is for those adults who can swim but want to improve their efficiency, speed, or general swimming enjoyment. This track is appealing to our triathletes who want to improve their swim splits while saving energy for the bike and run. Fitness and Masters swimmers also enjoy this track because we help improve efficiency, speed and overall enjoyment of the sport. 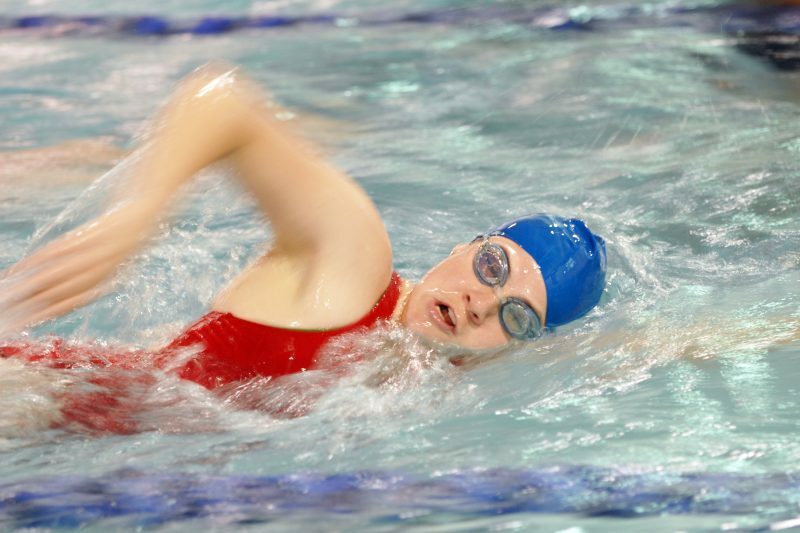 To enter directly into the Stroke Improvement track, you must be able to swim 100 yards of freestyle or 50 yards of the other strokes without stopping. Our coaches will assume that you have a developed stroke already and are looking to improve its efficiency. If you don’t think you can meet these standards, we suggest going through our Adult Learn-to-Swim track. Each of our stroke improvement classes uses a sequence of technical drills that gradually build the stroke from the simplest movement to the full stroke. Our adults like this approach because it breaks down and builds the strokes and explains how to train in a methodical way that makes sense to an adult. Your stroke improvement will be targeted so that your time in the water is most effective—something important in our schedule-stretched lives. We offer stroke improvement classes in all four strokes. Since most adults have an interest in learning freestyle, we offer stand-alone freestyle classes and two separate classes that focus on the backstroke, breaststroke and butterfly. What is the Class Sequence? We offer stroke improvement classes for Backstroke, Breaststroke and Butterfly. These classes will follow our monthly session schedule and we will do one stroke per monthly session, so you can get all three in over a three month period. If you have a desire to learn a particular stroke, contact our office to find out which stroke is being taught during that month. This class teaches the foundations of competitive backstroke, breaststroke, and butterfly. With each stroke, we will learn the principles of balance, streamlined body positions, and integrating the arm, leg, and core motion into a well-timed and efficient stroke. This class works on adding flow, power, and tempo/speed awareness to the strokes learned in the Three Strokes 1 class. This is a great class for those who are looking to train in these strokes for a competition or just to learn to swim further and faster. What Can You Expect from Our Adult Stroke Improvement Classes? What are the Pools Like? In our custom-designed Swim Studio, you will swim in a high-tech Endless Pool. Here’s why our Endless Pools will help you learn faster and make you a better swimmer overall. For classes that require a full-length pool with a deep end, we rent lanes at the UIC Student Center West. This pool is 25 yards long with an 11 foot deep end that makes it ideal for working on diving/turns or speed and stroke calibration. How Many Adults are in Each Class? We keep the size of our classes small to give each student more attention and practice. Our student-to-teacher ratio in our adult learn to swim classes is 3:1 maximum. Each adult class is 60 minutes long. Our classes run on a set 4-5 week session. You will focus on learning a particular set of skills during that period. At the end of the period, we will evaluate you and either promote you to the next session or refine the current set for another session. We will send you and evaluation at the end of the session providing specifics on your progress. What Do Others Say About Your Classes? What is the Cost for Group Classes? We ask you to start with a 3 session (~ 12-15 weeks) commitment to swimming classes at Chicago Blue Dolphins. We feel that three months is about the amount of time required to make a major impact on your swimming skills. Within a 3 month period, most of our adults have made major improvements in stroke efficiency and speed with our Freestyle 1 and 2 classes, are moving on to other strokes or advanced concepts in Freestyle 3, or have transitioned to the Fast Forward program to practice, improvement endurance, or prepare for a triathlon, Masters, or open water race. The monthly tuition for our adult stroke refinement swimming classes is $215.00. In addition to tuition, there is a non-refundable $20 annual membership fee to cover insurance and safety costs. If you continue on with us beyond one year (and we hope you do), you’ll be charged the membership fee on each anniversary. If you withdraw from class within the initial three session period, you will be assessed a $25.00 cancellation fee. For more details about withdrawing from a class, see “Disenrollment from Automatic Tuition Renewal” on our Policies and Procedures page. Yes, we do! Private lessons are ideal for adults who want to learn at their own pace or who need more flexibility with their schedule. While we offer both 25 and 50 minute private lessons, adults seem to work best with 50 minute lessons. With all of the different priorities in our adult lives, having a longer lesson usually allows more work to get done in each session. We also offer private lessons in one, two, and three person options. If you would like to do semi-private lessons, you need to provide the other members in the party. Purchases of five lessons at a time will receive a 5 percent discount. If you are unsure where you fit in to our group class progression or whether private or group classes best meet your needs, contact our office to schedule a 25-minute Skills Assessment lesson. Our instructor will run you through a series of exercises to determine your current skill level and then will give you an overview of the skills progression that best matches your skills and goals. When you register for a class, we charge your credit card that day for the first month of tuition. We will then set you up for automatic payment on the same day in subsequent months. We will keep you on auto pay until you move into a class with a different tuition or until you discontinue taking classes. In addition to charging you for the first month of tuition, we will also charge you a non-refundable $20 annual membership fee to cover insurance and safety costs. If you continue on with us beyond one year (and we hope you do), you’ll be charged the membership fee on each anniversary. Here’s the full schedule for our Adult Stroke Improvement classes. You can click the Filters “three bar” icon to filter the results by location, day of the week, time of day, class name, and instructor. If you see a SIGN UP button next to the class name, there is space available and you can register online. Please note that you can only register for the introductory class online, Freestyle 1. If you would like to register for a more advanced class, schedule a make-up, or put yourself on a waiting list for a class that’s full, please contact our office. Please note that we ask that you initially commit to 3 sessions of classes (~ 12-15 weeks) when you sign up. You will only be charged for the first month when you register online with the other two months charged on the second and third months after your class start date. You can cancel within the 3 month period, but you will be charged a $25.00 early cancellation fee. After receiving your online registration and payment, our office will charge you an additional non-refundable $20.00 for our annual membership fee to cover insurance and safety costs. If you continue on with us beyond one year (and we hope you do), you’ll be charged the membership fee on each anniversary. See “What is the Cost for Group Classes” above for more details on tuition and membership policies. We ONLY allow online registration for the first class in our sequence, Freestyle 1. If you see a SIGN UP button next to the class name, there is space available and you can register online. If you would like to register for a more advanced class, schedule a make-up, or put yourself on a waiting list for a class that’s full, please contact our office. After receiving your online registration and payment, our office will charge you an additional refundable $20.00 for our annual membership fee to cover insurance and safety costs. If you continue on with us beyond one year (and we hope you do), you’ll be charged the membership fee on each anniversary. If you would rather speak with someone, please feel free to call us at (773) 342-7250 during our office hours (Monday – Friday: 9 am – 7 pm | Saturday – Sunday: 9 am – 5 pm). You can also provide your contact information below, and a member of our team will get back to you within 1 business day.